Last week, we told you all about Isle of Madness, the new expansion for The Elder Scrolls: Legends (Free) that is on the way on January 24. If that was the appetizer and the expansion itself is the main course, then consider this something of a tasty salad: an exclusive reveal of one of the new cards. Yep, thanks to the folks at Bethesda, we’re serving up a look at the Ghost Fanatic, the handsome but transparent gent you can see below. In keeping with the theme of Isle of Madness, he’s a Spirit who can help you get some inexpensive payback on your opponent if some creatures have died on the same turn. Don’t just take our word for it. 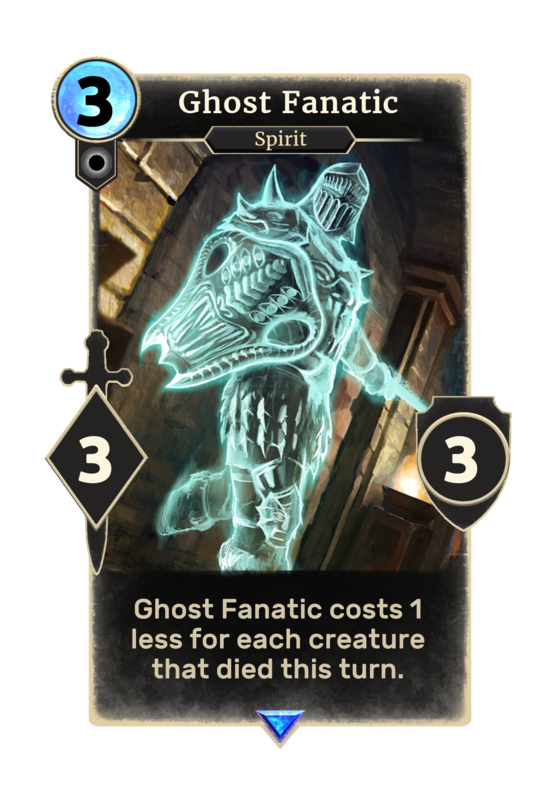 The developers at Sparkypants Studios delivered some commentary on their thoughts behind the Ghost Fanatic and what kind of decks can best put him to use. A 3-cost 3/3 is only average, but a 0-cost or 1-cost 3/3 can be extremely powerful. Token” decks or other fast Aggro decks that play a lot of creatures may want this card, since it can help re-fill your board after having to use multiple small creatures to destroy one of your opponent’s Guards. It’s not hard to see the gears spinning now for players devising uses for the Ghost Fanatic. Somewhere, Sheogorath is laughing in glee. And maybe you’ll have a chuckle or too as well when realizing that this is just one of 55 new cards that will arrive with Isle of Madness very soon. More details on the largest Elder Scrolls: Legends expansion to date can be found over on the game’s blog, and you can pre-order or save up in-game Gold to buy the three new chapters. Just take it easy on us with the new cards considering we did you a solid and previewed one here first, cool?